A thriving Greek village where the warmth of the welcome is as timeless as the beauty of it’s wide sand and shingle bay and beautiful mountain backdrop. The traditional, friendly Corfiot lifestyle has not been lost as Acharavi has developed; it is a place with lots of choices. Once a tiny agricultural village situated on the edge of a warm Ionian sea, it has gradually grown. The big Greek community makes it an all year round village with a bank, large supermarkets, a variety of shops and good choices of sea front tavernas, village grill rooms and local restaurants including a good Italian. The steady flow of return visitors have proved the welcome is as warm and friendly as ever and the appeal of the mesmerising sunsets over the off lying islands and the moon rises over the foothills behind are impossible to beat. The 5km long sand and shingle beach is well known, seemingly never ending as you look left and right! 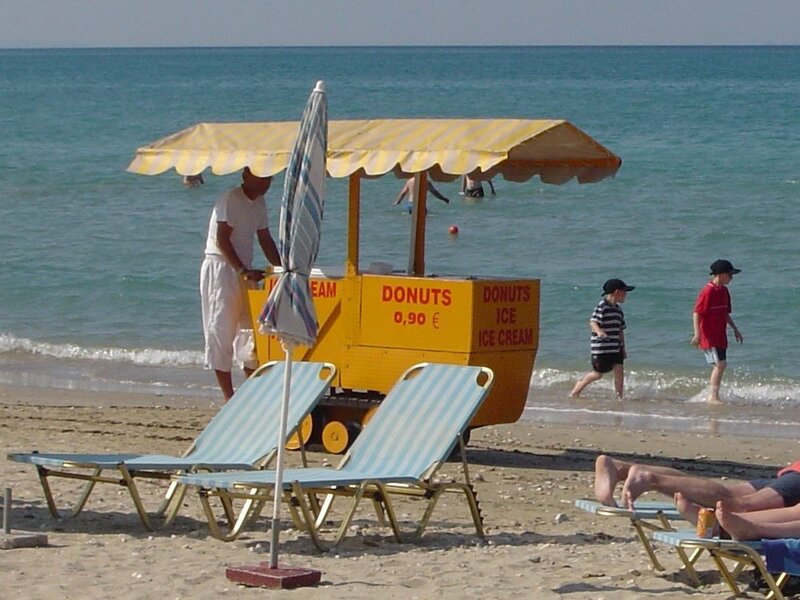 It is perfect for families and sun worshippers who want a lazy beach holiday. Acharavi also appeals to the more active who want to explore inland to the foothills of the islands highest peak, Mount Pantokrator, or just an easy coastal stroll along the beach to St Spiridon, there is a good network of blue marked footpaths for the walkers. For a break from the beach, Acharavi has a good choice of boat trips and excursions and has a local bus service to the nearby villages of Sidari and Kassiopi, and Corfu's Capital town. Hydropolis; a small waterpark on the edge of the village is good value for keeping children busy for the day. It does have few music bars for the night owls, but they don't disturb the peace and quiet for those who like to be early to bed! All our houses are either on the beach or just a short stroll away from the beach, local supermarkets, tavernas and free pools. 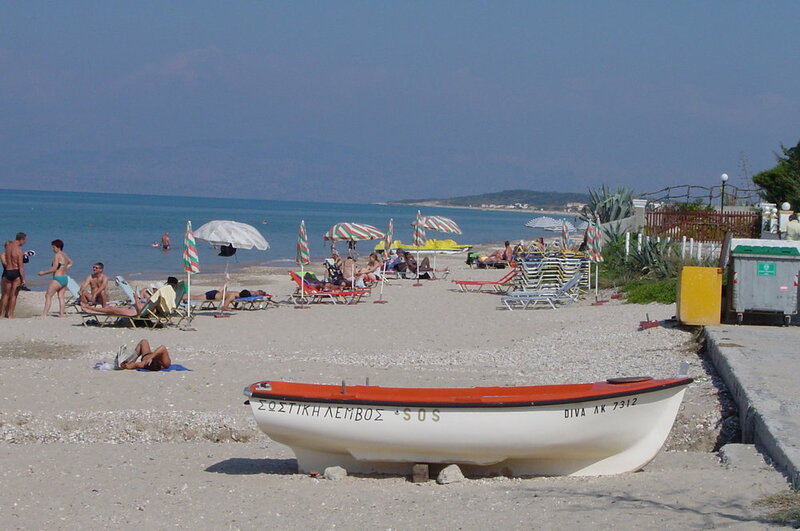 Acharavi is 40km from Corfu airport and transfer times are approximately one hour. These VERY popular renovated detached houses, are just literally steps from the beach. The patio has uninterrupted views out to the sea and the island of Erikoussa. The hardest choice of the day will be the patio or beach! Early booking essential! Also very popular; these two recently renovated, semi detached houses, have verandas back and front; great for chasing the sun.... or shade! They share the same location as Thalassa just minutes from the beach. Early booking essential! This renovated detached house with a side sea view looks straight across the Corfu channel to the mountains of Albania Its idyllic location is just steps from the beach. Early booking essential! Also very popular; these two renovated semi detached houses, have sea views from the tiled patio. They share the same location as Thalassa just minutes from the beach. Early booking essential! Ideal family holiday home with a lush, enclosed garden for sunbathing and relaxing. In a quiet location just minutes from the beach and village centre and has covered verandas both sides for al fresco eating and a good size sitting/dining room for cooler evenings. Special offers for early season bookings. Well established and popular apartments and studios with a large swimming pool; great for those who like to do some laps before breakfast and a pool bar in high season. Located near the beach and village centre, family run, they are ideal for families and couples. Small complex of spacious studios and apartments with shared swimming pool, a good choice for families, couples and large family groups who want to holiday together, yet be separate. Well known to Acharavi aficionados, Katerina herself bends over backwards to make sure you have a good holiday. Spacious one and two bedroom apartments with small shared swimming pool in a peaceful spot with lush colourful garden, just up the hill behind Acharavi giving wonderful sea views. This quirky one bedroom attic apartment is spacious and the rooftop terrace offers complete privacy with wide sunset and sea views to the outlying islands. The hardest choice will be a peaceful days reading under the shade of a large umbrella, a day sunbathing on the sunbed then cooling of with a quick dip in the sea!